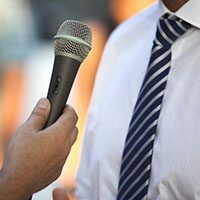 Got a media interview coming up? If not now, just wait. Today, it isn’t a matter of “if” you are interviewed by a member of the media, but when. In this 3 minute interview with Simon Lock, President of CommunicationsMatch.com, I was asked to give three good tips to help executives prepare for an interview. Want 9 guaranteed quick tips to make you a more commanding and engaging speaker? Fake news! What if you are a victim?